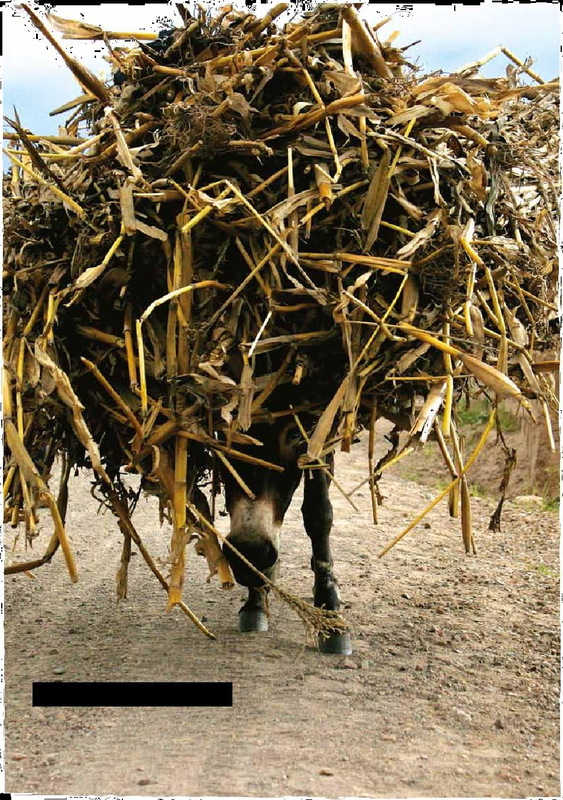 by D. Valette, Invisible Helpers: Women’s views on the contributions of working donkeys, horses and mules to their lives, The Brooke, 2014. Poverty is widespread in Pakistan and is particularly predominant in rural areas. As many as 58.7 million people in Pakistan are living in poverty. Nearly two thirds of the population live in rural parts of the country. In the Province of Punjab, 19 percent of the households live below the poverty line and more than 70% of the households are landless. People largely rely on informal sectors such as agriculture, livestock keeping, transport and construction to make a living. 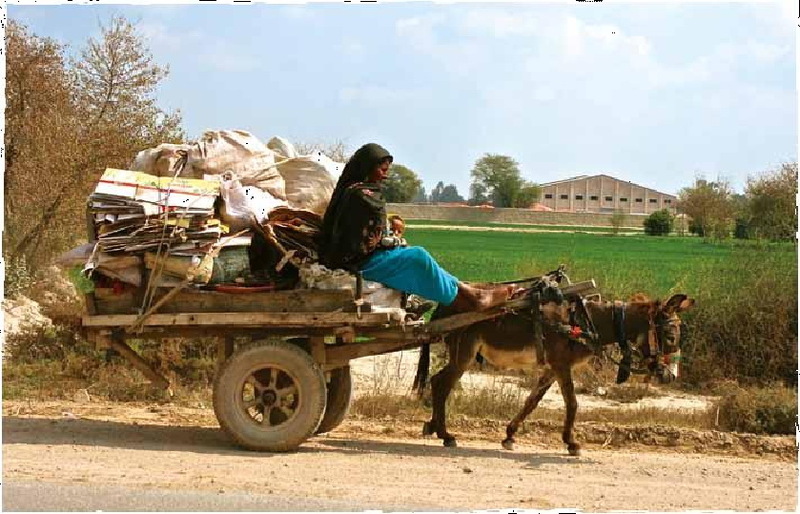 Working donkeys, horses and mules provide vital support to those people by transporting goods and people, generating direct income for their owners including women. It is estimated that over 12 million marginalised people, directly and indirectly, depend on working equids for a living in Pakistan. 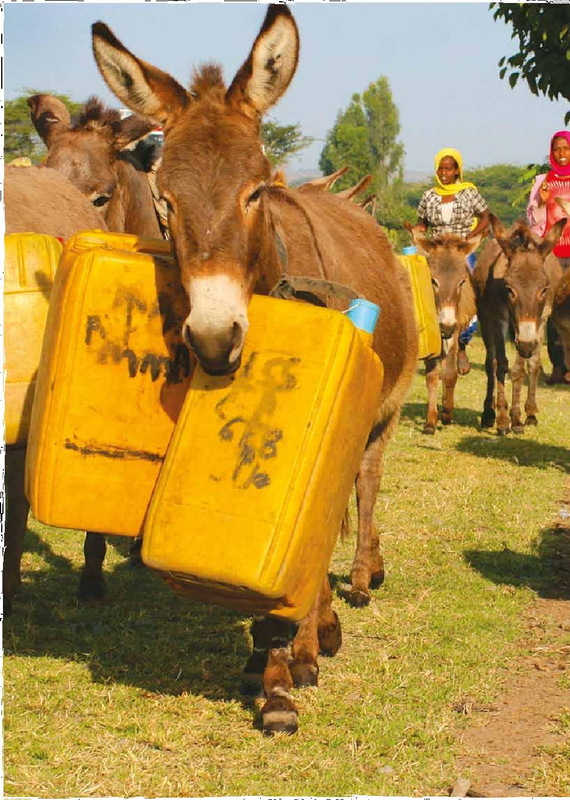 Working equids also provide invaluable help to women who rely on them to lessen the burden of household chores. For women, those animals are also often those who feed their children and contribute to their access to education and healthcare. According to the Pakistan Livestock Census, 2006, there are over 4.7 million donkeys, mules and horses in Pakistan. Ninety-five percent of them are working donkeys. Nearly half of the equine population can be found in the Punjab with 2.4 million animals, of which over 2.2 million are donkeys. In an effort to bring attention to the links between women and working equids, Brooke Pakistan met with women in the Punjab Province in order to hear their views and experiences of having those animals and the difference they make to their daily lives. This briefing highlights the findings from a participatory piece of research carried out in five communities. It shows the extent to which women rely on working equine animals for support in fulfilling their many roles within the household and the wider community. This includes help with heavy domestic work, providing income, enabling them to play an important role in their communities (thereby enhancing their status), and providing savings by transporting goods, agricultural produce, water, firewood, animal feed and manure. The briefing also highlights the devastating impact of the loss or sickness of a working equid on women and their families and the value of good equine welfare. The briefing concludes by making a set of recommendations aimed at Pakistan’s policy makers and implementers and key advocacy stakeholders. The study was carried out in the province of Punjab during one week in 2013. It was conducted through five women only Focus Group Discussions (FGDs) and individual interviews. Groups included participants from both female and male headed households living in peri-urban and rural areas. While working donkeys, mules and horses rarely make it onto the radar of policy makers and other development actors, for a large majority of the women we interviewed they were one of the most, if not the most important livestock in their households. When asked to rank their livestock, including working equids, 4 out of 5 groups across all communities put their horses and donkeys in the first position. The primary reason for women ranking working equids highly was due to their income generation role. In the rubbish collection communities particularly, donkeys are the only source of income and families solely rely on them to earn money. But women also highlighted the multiple functions performed by equids alone and not by other livestock. In particular, working donkeys and horses support women with household chores, and in performing social functions. In contrast the only function performed by other livestock when available (mainly buffaloes and goats) was primarily nutritional (milk) and in bad times, in the case of goats, monetary (sold for cash). 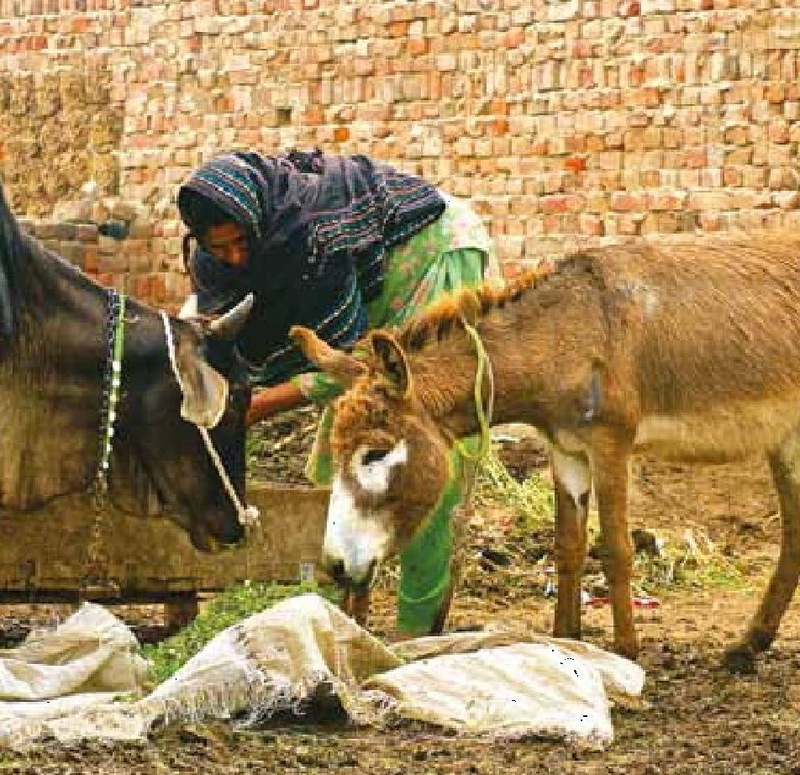 Women attached importance to working equids for their other livestock as donkeys and horses carry fodder for all livestock. The research also found that women use working equids for multiple purposes. All of the five groups said that working equids were used for income generation. In urban areas, rubbish collection is the main means of livelihoods of the communities we visited and women as well as men and children are involved in collecting rubbish. In rural areas, women use donkey carts to transport agricultural produce to the market or animal feed to local farmers. Despite their primary role in caring for equids the fact that they use working equids themselves, when asked about their sources of knowledge, the women we met told us they did not have access to any kind of education and training. Their knowledge was acquired through looking after the donkeys and horses themselves or from their husbands who benefited from being involved in working equine welfare groups established by Brooke Pakistan. Yet a large majority of the women we interviewed expressed strong interest and motivation in getting information and training that would enable them to better look after their animals and tend to their healthcare needs. Only one group (from the rubbish collection community in Talianwala) did not express a wish to be trained. Most women we interviewed in rural areas were interested in attending training and being engaged in equine welfare related activities. Women highlighted the importance of working equids to support them in carrying out household chores, in particular transport of goods, fodder, water and crops from the field to the market or from the market to their homes. This saves them a lot of time and they are better able to care for their children and tend to other tasks within the home. ‘Our donkeys are everything to us. Thanks to them the cycle of our houses runs. Without them we would suffer physically due to the extensive walking we would have to do every day,” one participant from Rasool Pura said. In Cha Chakera, participants told us that women who have a donkey cart can bring wood and fodder home in one hour and 30 minutes whilst it takes four hours for women who do not have a donkey. This was echoed by another group in Barthanwala, who said that donkey carts can transport a whole month’s worth of firewood in a single day, whereas women who carry wood on their heads have to fetch it every day. Therefore when an equid dies or is sick, it has a significant impact on women. “Without a donkey life is hard,” one Kausar Bibi from Talianwala stated. “Without a donkey we have to walk to get to work and we get very tired so we can’t work properly and we come back home late and we are not able to do the other chores,” one Rabia from Purani Sabzi Mandi said. The critical importance and financial contributions of working equids to women themselves and their families was clearly acknowledged by all the women we interviewed. All the groups we spoke to use working equids for direct income generation either as the main source of income (rubbish collection communities) or as one of their sources of direct income generation. “Donkeys earn their food themselves and even earn for us,”said Nadia from Talianwala. Whilst some women we spoke to are not involved in generating direct income, they do still support family earning through indirect income earned by working equids used for homestead purposes, which result in savings particularly with regards to transport costs. The reliance of women and their families on working equids means that the sickness or death of an animal has a major impact on income and therefore on the benefits they bring to women. Women have to use various kinds of coping strategies, including borrowing money, selling other livestock animals or taking up a loan to buy another donkey or horse and therefore become indebted. “If our donkey dies, we feel bad because it has spent a long time with us and has done a lot for us, but the actual grief is about losing our source of income,”said Jamila Bibi from Purani Sabzi Mandi. “My donkey died last month and now I don’t have any work or source of income,”Rani Bibi from Rasool Pura lamented. Working equids do not only provide economic benefits but social advantages as well. Women told us that working equids that they use or own play an important role in supporting them to carry out social functions and raise their status in the community. This is because these animals are assets that bring income and are also paramount in facilitating transportation for both equine and non-equine owners including in case of emergencies, for example taking people to the hospital. The social benefits of donkey and horse ownership were less important in the rubbish collection communities due to the pressure of work. In other communities, women told us that lending donkeys and horses in time of need or to help neighbors and relatives is common. Some women also see sharing their donkeys as an opportunity to meet their friends. 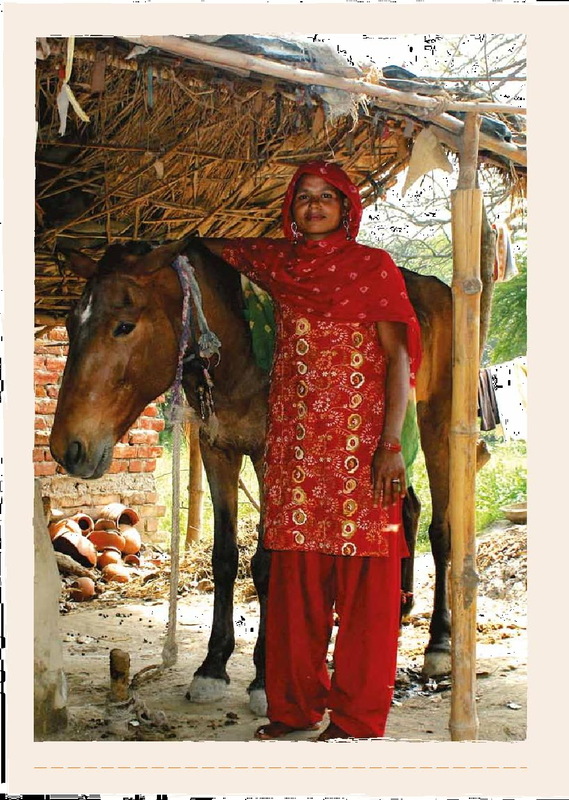 The research shone a light on the critical importance of working equids in women’s lives and the extent to which they rely on them for support in fulfilling their many roles within the household and the wider community. For women from equine owning communities, the health and welfare of these animals are essential. 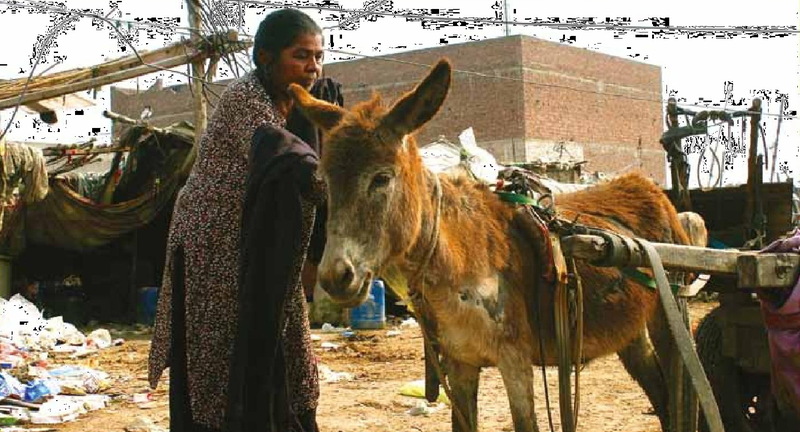 A sick or a dead donkey or horse will have dramatic consequences for women and their families. Some women compared losing an animal to losing a limb. Working equids in poor health are impaired in their ability to benefit women optimally, be it because they are overworked, suffer wounds, foot problems, or are not provided with adequate harnessing and access to nutritious food, shelter and water. Therefore good equine welfare is not a luxury but a necessity for women and their families. Without their help, women’s burden increases, income decreases and women are less able to perform social functions, which in turn affects their status in the community. The departments in charge of Livestock in all the regions of Pakistan should consider working equids as critical and valuable livestock for people’s food security and livelihoods. Working donkeys, horses and mules are at the cornerstone of tens of thousands of families’ livelihoods in Pakistan and provide a support system for women. Therefore the health and welfare needs of those animals should be adequately addressed by government policies and programs alongside with other livestock. This includes allocating sufficient budget for equine drugs, including working equids in vaccination campaigns and other livestock initiatives, and providing training on equine health and welfare for government vets and livestock technicians. The departments in charge of Livestock in all the regions of Pakistan and donor agencies should give greater priority to ensuring women’s access to extension services. Appropriate emphasis should be put on increasing the number of women being trained and employed as “agents of change”. Training and information related to livestock keeping must take women into account and specifically incorporate equine health and welfare, including husbandry. Animal Welfare legislation which specifically includes working equine animals should be adopted and effectively implemented through targeted and accessible awareness campaigns aimed at owners, users and carers. These awareness campaigns should specifically include women as women can be powerful advocates and need to be included in those campaigns. A dialogue between community based and non-governmental organisations working on gender and livestock, and organisations concerned with working equine welfare, should be initiated to better understand and explore the opportunities and benefits of collaborating on their mutual agendas. These organisations currently operate in silos which leads to missed opportunities for engaging women from equine owning communities, leaving them outside the scope existing initiatives. The article concerning equines and women is enlightening and provides information that many are not aware of. I am from the U.S. working with an institute to begin an equine therapy program for children with special needs here in the country of Pakistan. We were just discussing that we desperately need women to assist with the horses and children in the arena. The belief that was expressed was that women in this country are too afraid of horses. This program is being developed focusing on those in poverty. This article provides hope that the addition of women to the program is possible. The people handling the horses and working with the children are being paid. I would greatly appreciate being contacted by someone involved in the project the article is referring to.